Molissa Fenley has choreographed over 75 works in her continuing career in dance. With her company, Molissa Fenley and Company, founded in 1977, and as a soloist working in collaboration with visual artists and composers, the company has performed throughout the United States, Canada, South America, Europe, Australia, India, Indonesia, Japan, Korea, Singapore, Taiwan and Hong Kong. Her work has been commissioned by the American Dance Festival, the Brooklyn Academy of Music’s Next Wave Festival, the Dia Art Foundation, Jacob’s Pillow, Lincoln Center, the New National Theater of Tokyo, The National Institute of Performing Arts in Seoul, Korea, The Kitchen, Dance Theater Workshop, and many others. Both Cenotaph and State of Darkness were awarded a Bessie for Choreography in 1985 and 1988 respectively. Molissa has also created many works on ballet and contemporary dance companies, most recently for the Oakland Ballet, the Pacific Northwest Ballet, Robert Moses’ Kin and the Seattle Dance Project. She is Danforth Professor of Dance at Mills College, in residence in the spring semesters, and often teaches choreographic and repertory workshops at other universities, most recently at Bennington College. She is a Guggenheim Fellow, a Fellow of the American Academy in Rome, a Fellow of the Bogliasco Foundation and a Master Artist of the Atlantic Center of the Arts. The most recent performances of the company include the New York premiere of Redwood Park, music by Joan Jeanrenaud, the reconstruction of Esperanto, music by Ryuichi Sakamoto, at the Judson Memorial Church (September 16th) and the New York premiere of Dance an Impossible Space, music by Erin Gee, presented by the Bogliasco Foundation at the David Rubenstein Atrium, Lincoln Center (August 28th). Rhythm Field: The Dance of Molissa Fenley, published by Seagull Press launches in December. Nina Winthrop formed her company, Nina Winthrop and Dancers, in 1991. Her works have been presented in venues throughout New York and Los Angeles, including Danspace Project, Joyce SoHo, Brooklyn Academy of Music, Movement Research at the Judson Church, Mabou Mines’ Toronada Theater at PS 122, Roulette, Basilica Hudson, and The Flea Theater. 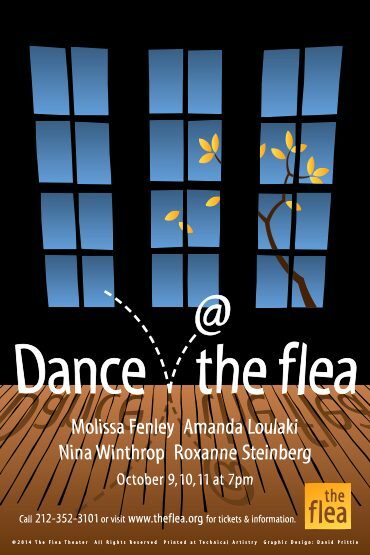 Nina has been the curator of Dance Conversations @ The Flea from 2005 to the present. Her dance films have been screened in the US and abroad. Nina was awarded a Bessie Schönberg Choreographers’ Residency at The Yard in 2004, a Dancenow/NYC’s Silo Artist Residency in 2005, and participated in the Schönberg Choreographers Lab at DTW in 2005. She is on the Board of Directors of New Dance Alliance and Danspace Project. A graduate of Bennington College, Nina danced with Wendy Perron, Susan Rethorst, Yoshiko Chuma, Sally Silvers and Kei Takei, with whom she toured the USA and Japan, and studied with Erick Hawkins, Merce Cunningham and Deborah Hay. Amanda Loulaki was born in Crete. In 1990 she received a BA in Education from the University of Crete, Department of Pedagogy and in 2007 and in 2007 she received her MFA in Dance from Hollins University. In 1994 Amanda was awarded a Fulbright Scholarship and moved to New York City. Amanda’s choreography has been presented at Danspace Project, La MaMa, Dixon Place, PS 122, Joyce Soho, Dance New Amsterdam, The Kitchen, Dance Theater Workshop, 11th Biennale of artists of Europe and the Mediterranean,(Greece), BucharEast.West International Dance Festival, (Romania) the Choreographic Center Archauz, (Denmark), and ZVRK Festival (B&H). Amanda was selected for The Barnard Project in 2007 at DTW and was appointed Adjunct Associate Professor at Barnard College of Columbia University during the 2007 fall semester. Amanda has taught at the American Dance Festival, M.I.T., Dance New Amsterdam and Rutgers -N.J.I.T. Theatre Program. Since 1998, Amanda has been the Programming Director at Movement Research and programmed the Improvisation Festival NY from 1999-2003. Amanda has also served on panels for Movement Research, Danspace Project, P.S. 1 Museum of Modern Art, Dance Theater Workshop and Lower Manhattan Cultural Council. As an advocate of experimentation in dance, Amanda Loulaki has been invited to attend conferences and platforms such as IDEE conference (Initiatives in Dance Through European Exchange, 3rd and 4th Balkan Dance Platforms, the British Dance Edition, and DunaPart, Hungarian Dance Platform. Amanda is a member of IETM (International Network For Contemporary Art). Roxanne Steinberg, dancer/choreographer has danced worldwide with composers and musicians Yas Kaz, Paul Chavez, Kenta Nagai, Tatsuya Nakatani, Leon Mobley, Myra Melford and Alex Cline and dancers Min Tanaka and Amagatsu of Sankai Juku. A founder of Body Weather Laboratory in L.A. (1987), she teaches and performs with dancer Oguri. She has been presented at Dance Conversations at The Flea since 2005 and in Flower of the Season, a dance series she co-directs. She has led workshops at Cal Arts, UCLA, Bennington College and Cal State LA. She choreographed for Body Vox in Portland and for artist Lauren Bon’s projects Not a Cornfield, Farmlab and Strawberry Flag. Working at Bon’s Metabolic Studio in Los Angeles, dance is her language to coordinate space and community. Grants: Annenberg Foundation, Department of Cultural Affairs Los Angeles, Los Angeles County Arts Commission, Durfee Foundation, artist-in-residence Electric Lodge, Venice.